TIFFANIE TURNER is a licensed California architect, fine artist and instructor in the art of paper flower making in the United States and worldwide. Her work explores nature and botanical specimens in extremely large and sometimes very small scales, in paper. Her work has been exhibited in the San Francisco Bay Area’s Bedford Gallery, Jack Fischer Gallery, the San Jose Institute of Contemporary Art, and at the de Young Museum in San Francisco, where she was the artist-in-residence. Tiffanie has appeared in Vogue, American Craft, the San Francisco Chronicle, and O Magazine and has been featured online on Design*Sponge, The Jealous Curator, and Poppytalk, among others. Raised in the woods of New Hampshire, Tiffanie now resides with her husband and two children in San Francisco, California, where she has lived for the past twenty years. "Tiffanie Turner’s creations are exquisite. Her D.I.Y. instructions for handmade marigolds, roses, dianthus and daffodils are meticulous." "Under the mantra 'You must make what you see, not what you think you see,' this book guides artisans to astonishing results." "The first time I saw Tiffanie Turner’s work, I was speechless. In her skilled hands, crepe paper, wire, and glue became tiny (and sometimes wonderfully larger-than-life) works of floral art, beautiful enough to anchor the grandest of dining tables. While Tiffanie’s flowers hang in museums and galleries, her book makes this intriguing art form accessible to even the most novice of crafters. I can’t wait to dive into this beautifully photographed book and its rich collection of inspiring projects." "Tiffanie and I were introduced decades ago at the San Francisco Flower Market, when I was a floral designer and she was an artist buying blooms to paint. Flowers are still her muse, but now she’s immortalizing them in a different medium. In an age when everything is fast paced and fleeting, it’s invaluable to create and share lasting beauty—and that’s exactly what Tiffanie does in this book." "This is a true labor of love from a truly passionate artist. Not only is Tiffanie’s attention to detail awe-inspiring, but so is her generosity of information! 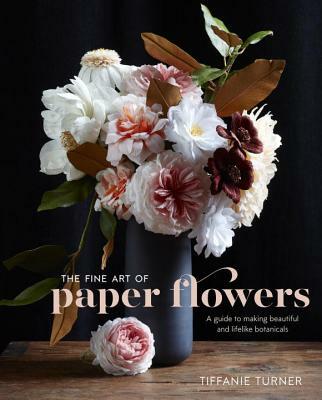 This gorgeous book is basically like getting the key to a treasure box filled with years of Tiffanie’s self-taught knowledge, brilliant tips and tricks, and, of course, more paper flowers than you can even begin to imagine."